Two new hyphomycetes from submerged wood collected in China. 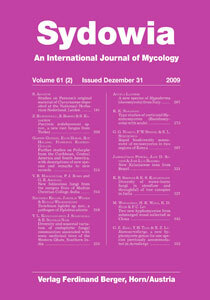 Wongsawas M., Wang H. K., Hyde K. D. & Lin F. C. (2009) Two new hyphomycetes from submerged wood collected in China. In the course of a study of freshwater fungi in Zhejiang Province, China we collected two new hyphomycete species from submerged woody materials. Berkleasmium zhejiangense is distinct in the genus in having conidia with a pale brown to brown subtending cell. Cacumisporium uniseptatum differs from other species in the genus in having one-septate conidia. Each taxon is described, illustrated and compared with similar species. Keywords: anamorphic fungi, freshwater fungi, taxonomy, Berkleasmium, Cacumisporium.